We prepare 1120 and 1065 tax returns for corporations and partnerships, as well as the 1040 series of returns for individuals. We prepare income tax returns for employees as well as the self employed, investors, retirees, farmers and landlords. We prepare tax returns for those in retail, wholesale, manufacturing, real estate, construction, transportation, education, medical, legal, and other professional services. We can file current year returns as well as prior year and amended returns. We can file for an extension of time to file also, if needed. We can prepare resident, non-resident and part year resident returns for all states. We attend over 90 hours of education per year to keep up to date with both federal and state tax law changes. We can help with all your income tax filing and planning needs. We also provide payroll services. We’re licensed by the State of Maine and have our processes periodically examined by the state, for your protection and peace of mind. We will prepare your employee checks or direct deposits, and also schedule all payroll tax deposits and payments. If you want to write your own payroll checks we can assist with that as well. All employee payroll as well as payroll taxes will be taken directly from your business bank accounts and paid directly to the payees. No money is impounded by us or is routed through bank accounts owned by us. You get your employee’s hours to us by phone, email or fax and we’ll do the rest. We will mail, email, fax or personally deliver your payroll checks and reports to you prior to each payday. We also will prepare all payroll tax returns, year-end W-2s, and can help with 1099-MISC preparation as well. All W-2 and 1099 Forms are filed electronically. Our goal is to make payroll easier for you. Barker Business Services LLC is an income tax preparation, payroll processing and accounting service located in Lincoln, Maine. It is a family business, owned by Bruce A. Barker Sr. and Bruce A. Barker Jr.
We file all eligible returns electronically, reducing the possibilty of errors generated at the IRS or State Department of Revenue that can occur as paper returns are processed into their systems. With our e-filed return you should receive your federal refund direct deposited into your bank account within approximately 7 to 13 days of filing. Add about five days for a paper refund check sent by U.S. mail. Bruce Sr. graduated with a BS degree majoring in accounting from the University of Maine in 1962 and the University of Wisconsin Graduate School of Banking in 1976. Bruce was employed by the State of Maine for 14 years as a bank examiner and has also been the office manager for two General Motors dealerships prior to starting his own business in 1989. Initially the Business was known as Triple Check (a franchise) Tax and Business Services, but went fully independent as Barker Business Services in 2001. In 1998 Bruce passed the E.A. (Enrolled Agent) exam and is enrolled to practice before the IRS for clients needing representation. Bruce Jr. joined him in the fall of 2001 following a 20 year Air Force career. While assigned to K.I. Sawyer A.F.B., Michigan and Dyess A.F.B., Texas Bruce prepared income taxes for military members and retirees as an IRS VITA volunteer. Bruce graduated with an associate's degree from the Community College of the Air Force in 2001. In 2012 Bruce Jr passed the IRS exam and became an R.T.R.P. (Registered Tax Return Preparer). On Dec 7, 2015 Barker Business Services moved from the office in Bruce and Emmy's home of 49 years, to the Lincoln Financial Center located at 211 Enfield Road in Lincoln. For 2017 both Bruce Sr and Bruce Jr received the IRS Annual Filing Season Program (AFSP) Record of Completion. 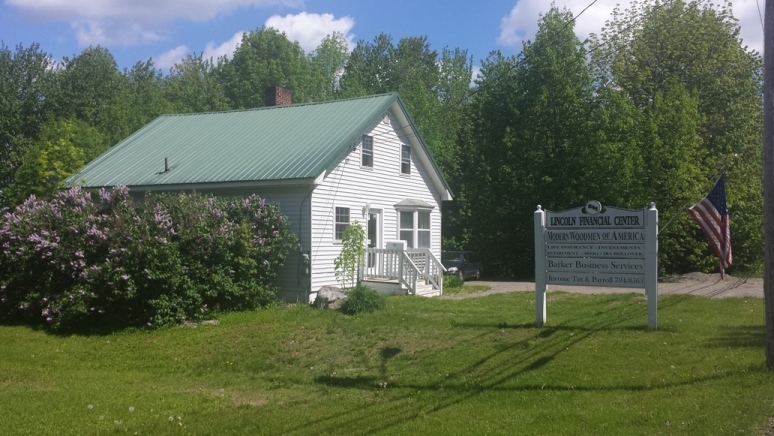 With over 40 years accounting, banking, payroll and income tax preparation experience the Barkers have been serving clients in the Bangor, Howland, Lincoln, Mattawamkeag and Millinocket areas since 1976. Whether its tax time or tax planning, payroll or accounting services, call Bruce or Bruce Jr. today. Don't delay! Call or email us for your tax organizer now. Click here to see how we can help you with your payroll needs. 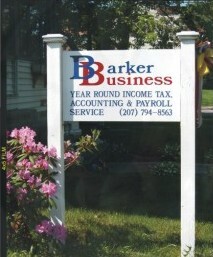 Barker Business Services, LLC is a Maine licensed payroll processor. As part of national associations and networks we have the support and resources that most other independent professionals can't match. 1040-ES Package Where's My IRS Refund? U.S. Small Business Admin. Hobby or For-Profit Business? Bruce and Bruce Jr. and their families are members of the Stewart M. Lord Memorial Historical Society of Burlington, Maine. Learn more at www.smlmhs.org. Page edited with Nvu and Sea-Monkey Composer. Page last updated November 28, 2017.